... 1932 (80 years ago today), at the closing ceremony of the Olympic Games in Los Angeles, 4 men and 2 women jumped from the stands and ran around the track carrying a “Free Tom Mooney” banner. Police arrested them, the band began the national anthem, and the parade commenced. 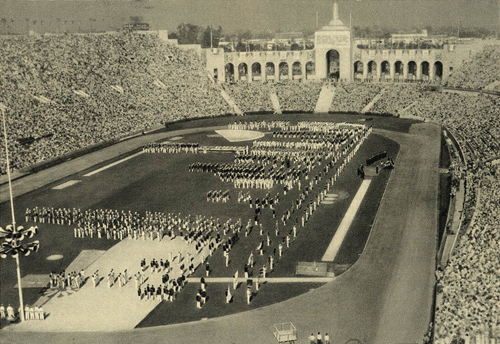 (credit for photo of 1932 stadium, known today as the Los Angeles Memorial Coliseum, on an unspecified date during the Games) They protested on behalf of Mooney, a labor activist who by then had served years more than 15 years of a life sentence imposed following a controversial conviction in a 1916 San Francisco bombing. He would be pardoned in 1939. Meanwhile, Southwestern Law Professor Leo Gallagher, a Southwestern Law professor was compelled to resign because he defended the "Mooney Runners," as the students who protested at the Olympics were nicknamed.